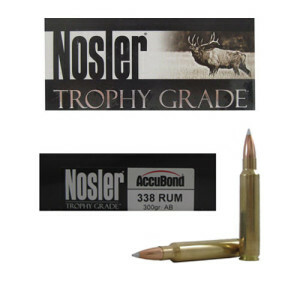 338 RUM ammo is also known as the 338 Remington Ultra Magnum. It’s a powerful rifle cartridge introduced in 2000 by Remington Arms company. The 338 RUM utilizes a 300 Remington Ultra Magnum case as its parent case that has been slightly shortened. The 300 Remington Ultra Magnum utilized a 7.62mm or 30 caliber projectile so the case had to be necked up to accommodate a .338 or 8.6 mm projectile. The case is beltless and features a rebated rim, making ejection difficult for anything without an aggressive extractor. The 338 RUM is one of the most powerful cartridges in the 338 series. The 338 RUM can hold it’s own with the 338 Lapua, as both do feature a near identical case capacity. The 338 RUM is exceptionally powerful round that can carry a projectile with exceptional lethal force over long range. This makes the 338 RUM ideal for hunting large game at long ranges of 1,000 yards or even more. The 338 RUM can fire a 250 grain projectile 2,850 feet per second worth of muzzle velocity, enough for hunting large species of deer and even bear.